I know that I'm getting ahead of myself here, but the opening of Waxwork has a moment which completely pulled me out of the movie. Sarah (Deborah Foreman) and China (Michelle Johnson) are walking down a suburban street to their college classes (is that a thing?) when they notice a "waxwork". Now, this is where we must pause and acknowledge that Writer/Director Anthony Hickox is British, so maybe "waxwork" is a common term there, whereas in the United States, we would more likely refer to it as a "wax museum". Also, they don't seem to be overly surprised to see the "waxwork". They comment that finding it in a residential is odd, but they take it in stride that a "waxwork" would even exist. When was the last time that you saw one? This scene is the introduction to an odd little film, which is followed by an odd little sequel. Anyway, while puzzling over the waxwork, a man (David Warner) suddenly appears and invites them to a midnight tour of the facility. Thus, Sarah and China return that night with their friends, Mark (Zach Galligan), James (Eric Brown), Gemma (Clare Carey), and Tony (Dana Ashbrook). (Which means that they were able to convince four other people to visit a wax museum in the middle of the night. Perhaps I value a good night's sleep too much.) Once inside, the group marvels at the incredibly realistic displays which feature many scary characters and theme. What some of them quickly learn is that once you step beyond the velvet ropes of the exhibits, you find yourself actually inside that world, where the monsters are very real. And, if you die there, you become a permanent part of the display. As their friends disappear one-by-one, Mark and Sarah must find a way to rescue them. Hickox was most likely influenced by real waxworks, which, as I'm lead to believe, do often feature depictions of violent or creepy acts. But, he was much more influenced by vintage horror movies. You see, when the characters get sucked into the displays and find themselves in another world, those worlds are essentially other horror movies, as they face things like werewolves, vampires, and mummies, all of which are pretty generic. But, it's pretty clear that the black and white zombie scene is a direct homage to Night of the Living Dead. Thus, Waxwork is a movie which sort of plays like an anthology, as we get an original wrap-around story, and then several vignettes which honor classic horror movie characters. While this sounds like a fun idea, there is something off about the whole thing. Hickox attempts to work some character development into the first act, where we learn that Mark is a spoiled little rich boy who has unrequited feelings for China, but this doesn't really add to the film. The highlight of the film should be the various "horror movie" scenes, but they are disjointed. The werewolf one is admittedly cool and the one with the mummy works quite well. However, despite some very explicit gore, the vampire segment goes on far too long and the Marquis de Sade piece doesn't really fit in with the rest of the movie. The third act wants to be action-packed, but Hickox attempts to inject too much corny humor, apparently attempting to mimic the laughs found in The Re-Animator and Return of the Living Dead. Overall, the editing feels very choppy, which is incredibly ironic, as Hickox's mother was a famous editor. Perhaps for this first feature film, Hickox bit off more than he could chew. The set-pieces certainly show some spirit, but overall, the whole thing is a bit stiff. 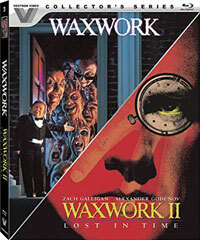 Waxwork could use a hand on Blu-ray Disc courtesy of Lionsgate. The film has been letterboxed at 1.85:1 and the Disc contains an AVC 1080p HD transfer which runs at an average of 30 Mbps. The image is sharp and clear, showing only mild grain and no overt defects from the source materials. The colors are good, but not overly vivid, and the image is never too dark or bright. The level of detail is acceptable, but some scene skew soft, and the picture looks flat at times. The Disc carries a DTS-HD Master Audio 2.0 track which runs at 48 kHz and an average of 1.6 Mbps. The track provides clear dialogue and sound effects. We get some mild stereo effects here, some of which do highlight sounds coming from off-screen and show good separation. The music never overpowers the actors. The Waxwork Blu-ray Disc contains an assortment of extras. We begin with an AUDIO COMMENTARY from Director Anthony Hickox and Zach Galligan. This is followed by another bonus audio track, this one featuring an isolated score and an audio interview with Composer Roger Bellon. "The Waxwork Chronicles" (82 minutes) is a six-part feature-length extra which is a modern-day documentary, which also utilizes some archived footage. The piece explores the making of the film in detail, from the inception to the reception. Involving comments from the creative team and some of the cast, it also looks at the special effects and the production. "The Making of Waxwork" (24 minutes) is a featurette from 1988. Hosted by Patrick Macnee, this offers comments from the cast and crew, and many clips from the film. The extras are rounded out by a THEATRICAL TRAILER and a STILL GALLERY. With Waxwork, Hickox created an interesting concept which allowed him to interject the various horror-movie themed scenes. With this sequel, he has brought us...OK, I'll be honest, I did not grasp the whole time-travel scenario. It doesn't make any sense and it's tie to the first film is tenuous as best. Hickox clearly doesn't care about this, because with Waxwork II: Lost in Time, the notion of merely hinting at other movies goes out the window, as he's now making short versions of some famous films. Hickox takes a somewhat different approach here, as the segments are much longer and less varied. The Frankenstein piece doesn't mimic any particular movie, but looks a lot lie something from Hammer. The outer space segment borrows very heavily from Alien, except that the monster is not very good. Any pretense of "resembling" other movies goes out the window with the piece which is a straight-up spoof of The Haunting, complete with black and white photography. However, the bulk of the film is taken up with a section that has a medieval castle setting, but doesn't resemble any horror film that I've seen. The finale plays like the finale from Stay Tuned, which came out the same year as Waxwork II: Lost in Time, as Mark and Sarah pass through several familiar settings, including the mall from Dawn of the Dead, and a Japanese city which is being threatened by a large lizard. The highlight of Waxwork II: Lost in Time is The Haunting segment, as it features a great turn by Bruce Campbell. Clearly inspired by the treatment which Campbell received on the sets of the Evil Dead films, Hickox tortures poor Bruce, creating some humorously uncomfortable moments. Outside of this, the movie is even more disjointed than the first movie. There's simply nothing definitively interesting here, and the medieval scene is so out-of-place that it's distracting. It appears that Hickox is simply determined to insert as many horror references as possible, and overall quality doesn't matter. We don't get the gore of the first film, but the off-key humor is still present. Hickox should have made a feature-length version of The Haunting section. Waxwork II: Lost in Time still needs a hand on Blu-ray Disc courtesy of Lionsgate. The film has been letterboxed at 1.85:1 and the Disc contains an AVC 1080p HD transfer which runs at an average of 25 Mbps. The image is sharp and clear, showing no distracting grain and no defects from the source materials. The colors look good (better than the first film) and the image is never overly dark or bright. The depth is good, but, overall, the image is slightly drab and doesn't offer that HD "pop" which we expect. The Disc carries a DTS-HD Master Audio 2.0 track which runs at 48 kHz and an average of 1.8 Mbps. The track provides clear dialogue and sound effects. Much like the first film, the track delivers some nice stereo effects. These effects are highlighted during the action sequences and The Haunting moments, as we are treated to sounds coming from off-screen. The Waxwork II: Lost in Time Blu-ray Disc doesn't carry as many extras as its predecessor. We get an another AUDIO COMMENTARY from Hickox and Galligan, as well as another isolate score and interview, this one featuring Composer Steve Schiff. There is a MUSIC VIDEO for the rap song which is heard during the end credits. The other extras are a THEATRICAL TRAILER and a STILL GALLERY.